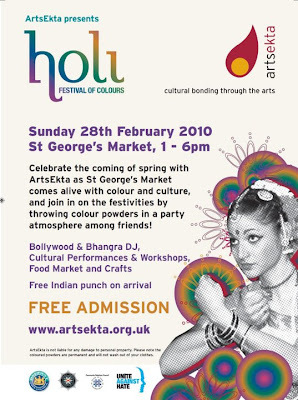 We called in for an hour or so this afternoon to catch the colour and fun of Holi - Festival of Colours - at Belfast's St George's Market. A great buzz, and wonderful to catch up with an Indian colleague I'd lost touch with a few years ago. Platform for Change launched yesterday at lunchtime in the Black Box. Barren Carousel kicked off proceedings with a spot of acrobatics that maybe summarised the Northern Ireland political scene and the fine balancing act that Platform For Change will have to conduct in order to get its message out without falling off the high wire. As secretary of the campaign group platform, Nuala McKeever contributed the shtick before Robin Wilson outlined the history and build up to the launch. Platform for Change stands for pushing “a positive political agenda which does not endlessly replay arguments linked to Northern Ireland’s ‘troubles’”. It wants politics and politicians to server the entire community and not to stymie progress and development. I captured a couple of quick interviews with signatories on the way out. The fragility and deadlocking vetoes that cripple the current Executive are unacceptable to the platform. As a starting point, Platform for Change have singled out “three demanding issues” to see what a wide-ranging consensus policies might look at. I attended a couple of the early meetings of Platform for Change and have followed its progress ever since. 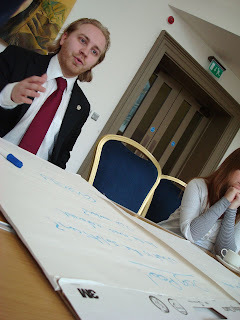 Many of the faces from the first meeting at QUB were there yesterday. If I step off the fence for a minute, it’s a good thing, a positive intervention in society and local politics, and sets up a stall in the middle of the public square that offers a chance for the re-engaging public as well as the usual suspects to work up consensual policies on some of the big issues facing us. The difficulty with Platform for Change is that at present it looks like a middle class revolution, an angry Alliance Party. Or maybe it’s liberal unionists with a heart for social justice mixing with nationalists that prefer practising collaboration rather than marching towards unity? 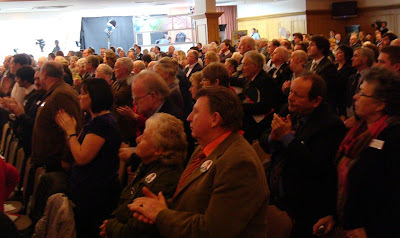 The platform’s key hurdle is to grow beyond the cucumber sandwich-eating brigade – Frances McCandless spoke exceptionally well on the subject – and reach out to real people in cities, towns, villages, estates and farms across Northern Ireland, while at the same time pushing their agenda firmly into the hands of the current political gene pool. Political representatives (councillors, MLAs and several Westminster candidates) from Alliance, Green Party, PUP, SDLP and UUP were all present at the launch and listed as signatories to the platform. However the SDLP were quick off the mark with their press release (handed to me at the end of the launch!) and to date seem to be the only party to centrally endorse Platform for Change. And their newest MLA Conall McDevitt blogged about it too. Contributors on Slugger O’Toole were less convinced! The day after becoming the UCUNF candidate for East Belfast in the forthcomng Westminster election, Trevor Ringland answered a few questions just outside the launch of Platform for Change in Belfast at lunchtime. He summarised what he felt were the issues facing East Belfast and his chances in the election. 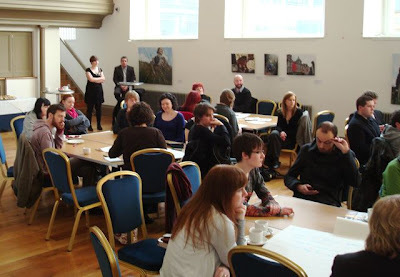 Last Thursday lunchtime, A-Politics Now brought together thirty or more people up to the Group Space at the Ulster Hall to discuss four topics before listening to the views of four local political representatives. A bite to eat, and then ten or so minutes spent at two tables out of the four looking at Environment, International Development, Arts Funding and Human Rights. Amongst the chat about public transport, night buses, the difficulty businesses have in recycling glass, there was a fascinating discussion about dog poo at the Environment table with the Green Party’s Steven Agnew. "... people have actually suggested that we set up a dog DNA register, a multi-million-pound dog-turd database, so police could work backweards to track down the offender, starting at the scene of the crime, complete with cordoned-off area, a little white tent and forensic experts in hooded bodysuits." No surprise that the Bill of Rights came up at the Human Rights table with Amnesty’s Peter Corrigan. Do we need an additional codification of rights in law? Why new legislation specific to Northern Ireland? Who currently suffers from discrimination, despite the existing legal protections? Will it keep lawyers well fed, or will it reduce the lengths to which under-served people must litigate to seek redress? The arguments were most convincing when looking at specific, non-conflict, examples of abuses in local society. Three Belfast councillors and a South Down MLA listened in and fed back at the end: John Kyle (PUP), Bernie Kelly (SDLP), John McCallister (UUP) and Michael Browne (SF). It was encouraging to watch some of the representatives sharing their contact details with people who’d raised particular issues about local government services at their tables and offering to help resolve individual situations. It was also encouraging to hear local councillors speaking about subjects in a non-party political way. Michael Browne spoke at length, and while admitting that the long-serving Castro may not be a great role model, our four year (re-)election cycle leads to populist policies and a shying away from difficult changes that would be better for society in the longer term. While the event format could be tuned, it was a great start, and offered some accessible lunchtime thinking and imagining. Kudos to Adam Turkington – who has a passion for these kind of sessions – and to the Winter Base festival. I didn’t intend to start a “scared of the other” series of posts, but something I thought about writing ten days ago, but didn’t, has continued bubbling in my mind and now spilled out. Question Time and David Dimbleby came to Belfast’s Waterfront Hall back on Thursday 11 February. The panel included Jim Allister (TUV), Gerry Kelly (SF), Margaret Ritchie (SDLP), Lord Trimble (UUP/Cons), Sammy Wilson (DUP) and Shaun Woodward (Lab). There were at least a couple of live blogs following the questions and answers: over on Slugger O’Toole, and on Biased BBC. Live blogs do have a tendency to become pass-remarkable. They’re informal, offhand and snippy rather than being an authoritative account of the event. One comment in particular stuck out from the Biased BBC coverage. It was written by that blog’s main organiser and writer David Vance, an anti-agreement unionist commentator who can often be heard on radio and TV, and is currently a spokesperson for the TUV (and tipped to be their Westminster candidate in East Belfast). Last time I checked, Muslims didn’t wear a special badge, wear a uniform, share a particular style of haircut … or all have the same colour of skin. You can’t spot a Muslim in an audience any more than you can spot a Christian, an atheist, a gay, an accountant, a lawyer, a fluent Irish speaker, or a TUV voter. Stating that there were no Muslims in the audience – to me – implies prejudice, religious intolerance and plain ignorance. Fear of the other. The comment got some debate over on Slugger at the time, though no direct response from David Vance on that point. Incidentally, the TUV are pretty vocal against the Irish language. David Vance recently issued a statement on the matter, and the TUV’s vice-chair and election candidate for Lagan Valley Keith Harbinson caused a fuss a few months ago when he issued a statement (later amended) calling it a "leprechaun language". On Sunday afternoon at 3pm, the QFT are showing Milk as part of a Unite Against Hate season. It’s a brilliant film that I’ve mentioned a few times before on the blog. 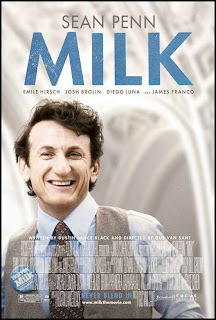 Milk is a dramatic retelling of the story of Harvey Milk (played by Sean Penn), interspersed with newsreel footage showing the real events in San Francisco’s Castro district. Asking why the local police are persecuting minorities rather than protecting them, Milk faces up to his beliefs and swells in confidence, turning to community activism to fight the oppression and homophobia he sees in the area in which he lives. You can read my review and reflections on watching Milk in a post from this time last year. It was the best film I saw all year, and it’s the one that made me angry. Creating ghettos and marginalising people’s identity isn’t smart, and isn’t loving. Well worth making it along to the QFT at 3pm. There’s a panel discussion chaired by William Crawley afterwards. If books are more your thing, then don’t forget the various bookish events being held this weekend for children and adults. Afraid of Irish? Scared of the other? After five years of French at school, I have a GCSE, mais si vous parlez trop rapidement I’ll be lucky to even pick up the gist of what you’re saying. Two years of German, and I can recite the alphabet with confidence at speed and count up to twenty. But wenn Sie Deutsch sprechen, I’m lost before you uttered the first word. As I understand it, languages shape how we think, how we model life, how we appreciate the things and people and events we find around us. Constrained by the tenses and patterns of forming sentences, different languages give different perspectives. Daniel Pennac is a French author. He has a dark sense of humour and uses language and puns to set the tone of his prose. His series of novels about Malaussène, a scapegoat, are well worth a read. Unless your French is a lot better than mine, you’ll probably want to read the excellent translations by Ian Monk, who – I’m told – preserved the humour and word play in his careful reversioning into English. I’ve no Russian – niet – but thoroughly enjoyed the dark subtexts in Andrey Kurkov’s novels Death and the Penguin and The Case of the General's Thumb. They’re more surreal than nearly any other fiction I’ve read – would you keep a penguin in your tiny apartment’s bathroom? – and come out of a sense of place that the country and the native language encapsulates. This is a long-winded way of saying that languages are good. They’re positive. They add value, bring colour, enhance our lives. Like many people, my fluency in Irish doesn’t get beyond Bord Failte, Tiocfaidh ár lá and Sláinte. But why the fuss when Gerry Adams announces that the British Government have agreed to continue to fund the Irish Language Broadcast Fund that has helped bring series like Seacht to our screens along with other gems. Early this morning, Nelson McCausland’s personal blog heralded the creation of the Ulster Scots Broadcasting Fund, which will be receiving around £1m a year for the next five years. He acknowledged that “the Irish Language Broadcast Fund has done much for Irish language broadcasting”. I am a Unionist and an Irish Language Speaker and am very interested in seeing the Irish Language being depoliticised in the same way that the Welsh language has been- after all the Irish language in Northern Ireland saw revival through Protestant speakers and activists (e.g. the women group in Cushendall). “One of the principles behind the strategy will be the promotion of a 'shared and better future' and that has to include the depoliticisation of the Irish language. I am keen therefore to look at opportunities for sharing and overlap between the two strands of the overall strategy. “What is it about the Irish language that so many unionists hate? Well, the fact that it was a baffling language spoken in prison by republicans is one reason. Another is that Gerry Adams has a habit of breaking into Irish when he’s speaking publicly, and a number of Sinn Fein people often open their speeches with a few words of Irish. Then there’s the fact that Irish has traditionally been the language of the native, an identifier which marks them off from the planter. All of these are reasons but none of them is a good reason. Republicans also had a reputation for studying a range of political thinkers during their time in prison, but most unionists don’t hate political philosophy. The occasional words in Irish by Sinn Fein people are always inoffensive and often welcoming, which makes those who get annoyed by them look churlish and even stupid. And if Irish as part of Irish culture is rejected because it’s part of Irish culture, that tells us more about the rejectionists than anything else. He went on describe unionists as “furious” with the £20 million now secured for the further development of the Irish language and pointed to Nelson McCausland’s speedy TV remarks “emphasizing that there’s also money for the development of Ulster-Scots”. There’s at least one regular Protestant church service conducted in Irish. There are plenty of people from all kinds of communities enrolled in adult Irish classes in many different venues. But can there really be no non-denominational (ie, state controlled or non-Catholic sector) secondary/grammar schools offering Irish? Looks like Jude is mostly right, but not quite. There are a small number of schools outside the Catholic-sector offering Irish. Some integrated schools like Lagan College offer Irish all the way up to A-level. Northern Ireland’s largest school Methodist College Belfast with a subject list longer than nearly another school makes no mention of Irish on its website, though used to offer it under the guise of curriculum enhancement in sixth form. Pupils at Friends’ School Lisburn “are also offered Irish or Japanese as part of the Sixth Form Enrichment Programme”. No mention of it at Wallace High School across the road. Update - Wallace offer Japanese as part of their Enrichment Programme, but still not any Irish. So there are a few exceptions. But very, very few. I’m staggered at how progressive many of these schools are in introducing new disciplines like Moving Image Arts, and yet curious why they think there is no demand for Irish amongst their (majority) protestant and of-no-religion children and parents. Is it a kind of institutional sectarianism? Is it purely about demand? Is it about fear of trying? Given that we live on an island with a land border with a country that a proportion of school children will choose to do further study in, and sometimes even settle down and live in, having Irish would open up some work opportunities to them. Possibly more than having German! Which brings be back to my question. Why are so many people afraid of Irish? While it may be used as a political football at times, it’s not a flag. It’s not territorial. It’s a language. Less obscure than Ada or Lisp. And probably a lot more beautiful and illuminating! There's an increasing amount of good low-cost stop motion animation around on the internet. A Brief History of Pretty Much Everything is another good example, from the pen of DispleasedEskimo. (Also loved The Amazing Adventures of To-To the Tortoise. More books, but a different type of library post from the last couple on the blog. The Linen Hall Library is keen to get people in through its doors. And they’re keen to include children in their activities too. On the fourth Saturday of the month they’re running reading times for children at 11am. Aimed at 4–7 year olds, it offers half an hour or so story telling and a chance for accompanying adults to wander around the library or recharge in the second floor café. Storytime is next running on Saturdays 20 February and 20 March. For bigger children, I notice that their reading group will be taking a look at George Orwell’s Nineteen Eighty-Four at 1.10pm on Thursday 25 March. Admission free. More bookish delights in store at Belfast’s Black Box next Sunday afternoon from noon with the return of Black Books. Alongside the adult bookishness Tea and Tales in the Black Box Café offers children’s fiction storytelling on the hour and bean bags and books for those who want to do it themselves. One-shot wonder Matthew Alexander Patton teamed up with them to make a video to accompany their new single (are they still called singles?) Kid’s Don’t Behave Like This. 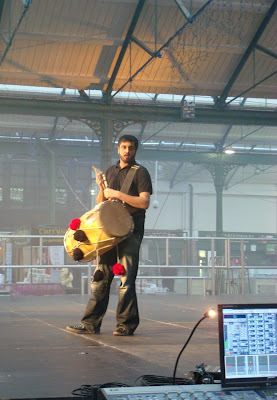 “The video was structured entirely to highlight the journey and crescendo of the music, whilst at the same time really driving home the idea of being together to enjoy something – Gerry’s journey takes him from practice, past other bands, buskers, through fanfare and eventually it all leads into the party at the end. Everyone in the video is a fan or close friend of the band, and so it is special to be able to point and say here is an event which brought people together to celebrate what music is all about. 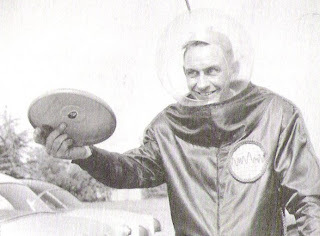 When [Knerr and his business partner] saw Fred Morrison playing with a plastic flying disc he called the “Pluto Platter” they bought the idea from him, modified the design and, as the Frisbee, it sold in millions in the late 1950s. A “professional” model was developed in the 1960s, and the team sport Ultimate Frisbee is still popular among students in the US and the UK. Today the news broke of the death of Frisbee inventor Walter Fredrick "Fred" Morrison (pictured above). That ever-authoritative source Wikipedia explains the origin of the Frisbee. Don’t forget to check out The Daily Strife and cast your vote for the Northern Ireland-produced entry in RTE’s online Storyland competition if you’re impressed and want to see more. Voting ends on Tuesday 16 February with the announcement the following day of who is through to the next round and will be showing their third episode. Happy to escape into a book? A story on the news this morning was celebrating that 36% of NI library users are children, higher than the UK average of 33%. Locally, The Boy in the Striped Pyjamas was the most borrowed book last year – no surprise given the promotion of the book across NI libraries to children and adults alike. It was how I came to read the book! The radio interview with a Derry librarian touched on the tension between books, the internet and video games. Her conclusion was that while children often turn to the internet for information and enjoy playing games, they are still happy to escape into a book. A timely reminder that the consultation on the future provision of library services in Greater Belfast is open until 6 March. There’s an online questionnaire as well as the paper version and a series of public meetings. In the meantime, are you happy to escape into a book? Have you been avoiding the arts for a while? Not been to the theatre or to a concert? Fancy a free ticket to kick start your interest? Test Drive the Arts has just been launched in Northern Ireland. The website lists shows – initially in Belfast, but expanding to other areas in April – and allows individuals to select a single free ticket to an event of their choice. You mustn’t have been to a show from the organisation you want to test drive for at least three years. And you only get one free ticket ever. So choose carefully. If you want to go with a friend, they’ll need to register separately as the tickets are offered to individuals. But something for nothing, can’t be bad. And by accepting Test Drive tickets, you agree to complete two quick online surveys; one sent shortly after the performance and one a year later. You’re also authorising Audiences NI to keep send you the Culture Northern Ireland e-newsletter. Though can opt out of these communications at any time. Test Drive the Arts NI is brought to you by Audiences NI, Culture Northern Ireland and the participating arts organisations. Oh, and funded by Belfast City Council and the Arts Council of Northern Ireland. A couple of weeks ago, I posted about the 8 minute 15 second reprise of the first five series of Lost. But condensing and reviewing the show seems to have become a popular pursuit. The Guardian are hosting the Reduced Shakespeare Company's version of Lost in 10 Minutes. I can't embed the video, so you'll need to click to view. And the Guardian's former live TV blogger Anna Pickard, now living in San Francisco, recently started tellywonk, a TV-focussed blog. She managed to watch and review the first five series in the week before the sixth series started. While most viewers are left confused at the week-to-week plot twists and turns, Anna's brain must be spinning inside her skull - or else turned to mush - after her swift sheep-dip into island living. Update - January 2011 - stage two of the strategic review is now underway - this time looking at libraries outside Belfast. If you’ve an opinion, do respond to the libraries consultation (which you can now do online) and consider attending one of their remaining public meetings. @NiallSF // "library not a business but a public service" - very fair point! @williamcrawley // @dawnpurvis I tend to use bookshops and online book outlets. Your tweets are making me want to join a local library! @NiallSF // one man suggested the panel are "creating the conditions for closure"
@NiallSF // one member of the public suggested "why fix something that isn't broke?" @williamcrawley // @dawnpurvis Grove was my first ever library. Still remember the excitement when I got my first library card - the first ID card I ever had! Update - fair play to them, Libraries NI are publishing notes from the consultation events on their website, including this one. Local government transition committee across Northern Ireland only have “voluntary status” until the Reform of Public Administration legislation is passed by the Assembly. With boundary issues still outstanding, there is no sign of the Department of Environment starting to turn the legislative handles* just yet. In the meantime, decisions taken at the transition meetings are recommendations, and the minutes are then tabled for approval at all councils concerned before they can be ratified. To ensure transparency, Transition Committees will make arrangements for public access to the decision making process. A communication strategy should be developed to regularly inform the public and stakeholders. It was agreed that meetings of the Transition Committee would be open to the media, public and press. The Committee would still retain the “Into Committee” arrangement for consideration of confidential business during which the media, public and press would be excluded. Agenda and reports (minus appendices) would be furnished to the media in advance of the meetings, with the appendices being provided, if requested, with the exception of any confidential correspondence. RECOMMENDED: That Minute Ref No: 3.8 be withdrawn. (a) until such time as the Transition Committee becomes statutory, the minutes of the meetings should not be made available to the public or press. (b) Furthermore, each Council should, in the interim, consider the minutes of the Transition Committee during the “in committee” section of their respective Council meetings. - should one Council agree to adopt the minutes and the other Council did not, the relevant Officers liaise with the other Council in order that the minutes were not made public until the other Council had adopted the minutes. The Chief Executive (LCC) reminded the Committee that no decisions of the Transition Committee were progressed until both Councils had adopted the relevant minute. So, when the August minutes were ratified by both councils – probably sometime in September or early October – the minutes and the meetings were public. It was agreed that in view of the significant workload involved in Committee Secretarial support that minutes would be in bullet form for future meetings, whilst allowing Committee members to request full text to be included on request at the relevant meeting. At the beginning of the transition committees, a quorum of three councillors from each council had was required. But Gareth Robinson successfully argued in July 2009 – when only two Lisburn councillors had turned up – that as the committee was voluntary and didn’t have a statutory status, the quorum rule could be suspended. As there were only two Elected Members from Lisburn City Council present at tonight’s meeting, Members discussed whether a quorum was applicable in this instance. Councillor Robinson stated that the meeting should proceed on the basis that the Transition Committee was currently a voluntary group and the standing order relating to a quorum would not take effect until it became a Statutory Committee. Furthermore, as the minutes of the Transition Committee would be tabled at each of the respective Council meetings for ratification, Elected Members would have an opportunity to raise any issues or disputes relating to their content. The Vice-Chairman sought the opinions of the two Elected Members from Lisburn City Council and they agreed that the meeting could proceed on the basis that Members would only be making recommendations at tonight’s meeting and the minutes would subsequently be tabled at both Council meetings for ratification. Handy, since part way through the November 2009 meeting, Lisburn were down to two councillors again! Of course, all this is while councillors get paid an additional allowance (£2,700?) to cover their work on the transition committee. Remember that none of these minutes will be easily accessible from Castlereagh Council's website as they don't do online publishing. While we’re talking about minutes, Sinn Fein MLA Daithí McKay recently blogged about tabling a number of questions to the Environment Minister on the subject of local councils publishing minutes online. The answer came back only two councils don’t publish minutes online – Castlereagh and Dungannon. (Magherafelt only started publishing there minutes online in October … after a bit of a battle to see them.) Daithí has now tabled some more questions on the subject ... to be continued! I blogged a couple of weeks ago about the RTE Storyland competition and the local interest in the Daily Strife entrant. Six teams can got through the initial sifting and been allowed to produce two episodes (costing no more than €8,000 per episode). One had to be withdrawn, leaving five productions now being screened online in a knockout competition. The Daily Strife is written and directed by Cecilia McAllister and produced by Mairin Murray. It’s the only show in the competition to be commissioned from a company operating in Northern Ireland. Two episodes can now be viewed from the RTE Storyland website. After the votes are tallied, one production will be dropped and the rest will go on to make a third episode. Glenn wakes up overwhelmed by the decisions he has to make in daily life. He wants to leave his wife but ends up being intimidated and attacked by local children who snow ball him. He calls his wife to rescue him! Glenn’s office co-workers act as though they are in Wall Street. Glenn escapes to a cottage in the country but when a scary man with a gun comes near … he calls his wife to rescue him! If you like what you see, why not give them a vote. You can follow the progress of Daily Strife on Facebook or follow them on Twitter ... and be reminded when you can vote! The SDLP’s annual conference was a curious beast. It still retained the traditional party-centric inward nature while squeezing some public facing sessions into the middle. With 172 motions to consider – down on the 215 from last year’s conference! – there was an enormous amount of business to get through on top of the televised speeches. (Update - you can read some more about Friday night's motions and debate over on Mr Ulster's blog.) There was also the small matter of a leadership contest, and less-well publicised party executive elections. The Open Unionism blog ran a couple of posts by Bobballs on the subject of party conference innovation and promoting political engagement back in November. We even talked around it in episode 5 of NvTv’s Blog Talk. A couple of years ago, the BBC started to broadcast a couple of hours of the main party conferences live on the internet and BBC Two. It fundamentally changed how the local party conferences run. The speeches from party leaders no longer finish the conference but are now in the middle of the day to coincide with the live broadcast. Other topical speeches and presentations were squeezed in on either side of the leader to present as positive image of the party to the viewing public during the broadcast window of opportunity. A lot of parties – eg, UUP, DUP, Alliance – have turned their conferences into crisp, media-friendly, voter-engaging meetings with no internal business visible other than a handful of high profile set piece resolutions on the important political issues of the day. But the SDLP are unlike most parties. They run a 48 hour conference stretching from Friday evening to Sunday afternoon. They seem to truly put the “social” and “party” into the Social Democratic and Labour Party! So for those staying over in the Slieve Donard Hotel, a leisurely breakfast seemed more important than obeying the instruction to be seated by half nine. Business finally started about 25 minutes late with only 30 delegates in the huge conference room. Numbers rose to 400 or more by the time the leadership candidates gave their speeches. With such a small audience, there were few contributions from the floor. Declan O’Loan expressed his annoyance at the debates on important issues of justice and policing (motions 57 – 75, though they stopped after 61) being cut short in this way. On the subject of parading, Declan O’Loan felt that “far more parades should be contentious”. In other words, all parades marching through an area that predominantly voted differently from those marching should automatically be deemed contentious and problematic. Considering the idea that local councils might have a role in making parading decisions within their boundaries, Brid Rodgers was unenthusiastic about the idea of Craigavon Council making a decision about the Drumcree parade. Both party leader candidates had a chance to address the conference on Friday evening, and again this morning. Alasdair McDonnell was up first. The speech was ok; the delivery was awful. Looking back over the printed version of the speech, it is obvious that he was trying to appeal to the grass roots members of the party who all have a vote this weekend. He made it personal, and pointed out his weaknesses as well as those of the party. He ended by promising to “make the changes needed to deliver at least 20 seats in the next election”. Hopefully referring to the next Assembly election (where the SDLP currently have 16 MLAs) rather than an over-ambitious plan for the next election to Westminster! Margaret Ritchie followed. Her speech ticked the boxes of name checking party greats (John Hume, who she wants the new bridge across the Foyle to be named after), her campaigning (“I licked the envelopes and knocked the doors because I believed in this vision”), her political career (25 years on Down District Council, Party Offices, “spent more time as a Minister in a Northern Ireland Government than anyone in the history of the SDLP”). She talked as if she had already won the vote – which is a good technique. Having accused Sinn Fein of lying, she proposed that they and the UUP support an SDLP nominee for Justice Minister. For the first and only time in my four hours at conference, she mentioned a United Ireland – surely a key objective of a nationalist party. To close, Ritchie laid it on thick with her praise for Mark Durkan (cue applause), stated “that Mark has agreed to play a key strategic role in my top team … and there will be an important role for Alasdair too”. I beg to differ. I witnessed numerous visceral responses directed towards Alasdair McDonnell from party workers. Much swearing, little of it under their breath! While party loyalty may take over if he is elected, there is a fair degree of polarisation and consternation amongst core party supporters at the idea that either one of them will be in charge. Other party members expressed the opinion that Margaret Ritchie was all style and no substance: the continuity leader who was getting implicit support from Mark Durkan and the party apparatus, bigger airplay in the latest Party Political Broadcast, but wouldn’t command the same respect (and votes) from the grass roots members. Even the suggestion that all the Ritchie publicity posters erected on the roads into Newcastle where an attempt to boost her local profile and allow her to run for 73 year old Eddie McGrady’s South Down seat at Westminster if she didn’t get the party leader post. The result will be announced around 12.30pm on Sunday – and should be carried live on the BBC One Politics Show. In the meantime, the candidates’ youthful supporters were wearing branded T-shirts, and sticking badges on anyone who would take them. Unfortunately young women, wearing short skirts and “I’m with Alasdair” T-shirts didn’t really match McDonnell’s image. 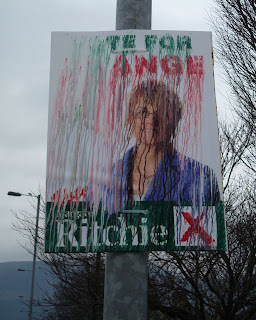 And I’m not sure Margaret Ritchie benefited from helium balloons and the outdoor posters whose ink ran in the rain. Based on Saturday morning’s performance, I’d predict that Margaret Ritchie will win. However, it’ll be a bumpy road for the new leader, and I’d predict another new leader within five years. Update - Sunday - Margaret Ritchie topped the poll (unoficially 222 votes to 187) and is the new SDLP Party Leader. No word about the executive election results. Durkan welcomed “the fact of a deal” at Hillsborough, but pointed to the effort that would be needed to check out “its detail – or lack of it”. He also welcomed the “date for the transfer of powers”. Sinn Fein got a page or so of beating for pretending to push alone for devolution, for mis-selling the St Andrew’s Agreement, for conceding a new veto to the DUP, for conniving with the DUP to circumvent d’Hondt”. There was emotion in Durkan's voice as he talks about his personal contributions to “real politics” which he summed up as “Service – not status”. 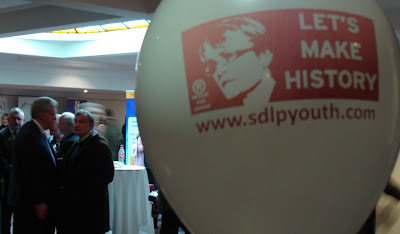 Suddenly the SDL bits of the SDLP got some focus, with mention of public services, childcare vouchers, 10p tax, Presbyterian Mutual, Desmonds’ pensions, the Human Rights Act and the Bill of Rights, 42 day detention as well as standing up for the rights of others in Gaza, Lebanon, Burma and Tibet. Durkan was all too aware that party members had been “bombarded with leaflets and literature” and phone calls during the leadership campaign. Twitter and Facebook got a mention. Alasdair McDonnell hid under table when Durkan mentioned his phone ringing during a live TV interview. He used nearly an equal number of words to describe McDonnell and Ritchie. Of McDonnell: “He has again vocalised his strong commitment to the task of party organisation in his campaign.” Of Ritchie: “The DUP and Sinn Fein … may be able to outvote her. But they have yet to outmanoeuvre her.” Think Ritchie gets Durkan’s vote. There was applause for Durkan’s warm words about Carmel Hanna. Her replacement as MLA, Conall McDevitt “brings youthful vitality and thoughtful vision”. A call for more new women SDLP MLAs. And respect for two councillors who died in recent months, Peter O’Hagan and Ignatius Fox. Durkan introduced his speech’s strap line “dream big dreams” through a story about President Obama signing a copy of his Inaugural Address for Durkan’s daughter Dearbhail. And like David Ford’s speech which ended with his grandchild being brought up on stage, five year old Dearbhail was in her father’s proud arms as the press gathered around at the end of the speech. 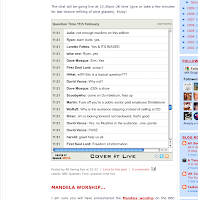 The applause continued until long after the live broadcast had stopped. Some delegates looked teary – but will they be so emotional when the next leader steps down I wondered? It was lunchtime, and I headed out of the hotel into the windy car park to return home to real life. The delegate pack says “Join us in our vision: a better way to a better Ireland”. But I’m not sure I heard that better way being articulated terribly clearly. I saw an old-fashioned party with social media logos on their conference platform stage. I saw the golden opportunity of a live broadcast given over to the outgoing leader’s speech rather than launching the new leader’s vision. I heard no one say a bad word about Mark Durkan. But for all the talk of change, I’m not sure how the public will notice the SDLP different next week, next month or next year. Perhaps the change will be that the SDLP Youth movement will continue to feed quality people into party roles (elected/co-opted and behind the scenes) and in five or ten years time, people like Nicola Mallon, Maria McCarty and Niall Kelly will be holding significant party office rather than working to get McDonnell and Ritchie elected. Conference urges the Assembly Group to resign from the Executive and to form an Opposition to the DUP/SF Coalition. I’d have loved to have heard the debate! I heard about the Greater Belfast Library Review in the middle of January. At that stage, the Libraries NI website had only uploaded a couple of documents to detail their consultation and explain their rationale. They’ve subsequently released more information. The proposals involve closing around half the libraries in Belfast and refurbishing/rebuilding a quarter of them. About four or five years ago I remember living in East Belfast and hearing about a previous set of library cuts. 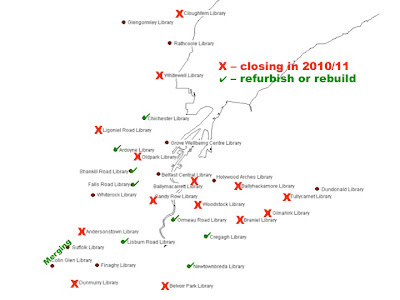 At that stage, smaller libraries like Braniel and Gilnahirk suffered large cuts to their opening hours. I remember a local family who weren’t able to install broadband at home explaining the effect the cuts would have on their teenage children who relied on being able to walk around to the local library after school to look up reference books and search online to do their homework. Local libraries have a role to play in literacy – reading and writing – as well as digital media literacy too. They’re centres of knowledge, whether through reference books, local newspapers (with job listings) or the erudite staff. Libraries are also part of the social fabric of society: places for people of all ages to meet – whether kids after school, retired people – and somewhere for parents with young children to escape to when they’re going stare crazy at home. The branch-specific pack of information about Braniel doesn’t explain that the opening hours are currently only Monday 13:00-20:00 and Wednesday 10:00-17:00 – a total of 14 hours a week – which may go some way to explain the number of active borrowers has dropped by a third between 2006 and 2009. About a mile and a half away in this densely populated area of East Belfast, the Gilnahirk library branch (strangely) has identical opening hours and a similar profile of active users. Much healthier is the library in Tullycarnet – a recognised area deprivation where just over half of households have access to a car – which has a much larger number of active borrowers, many more hours of internet usage, and is open six days a week. The review suggests that all three of these libraries should shut. It goes further and recommends the closure of the Ballyhackamore library too. 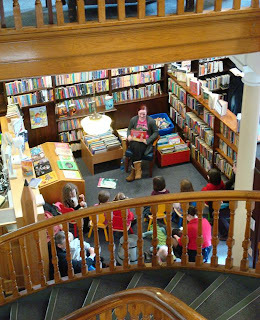 Living in the area for three years, Littl’un’s first experience of the joys of a library involved going up the spiral stairs to enter the magical bookish paradise that is the Ballyhackamore branch. It only took a few minutes to walk to it and it was a source of leaflets and brochures as well as children’s books. Strangely, Ballyhackamore has the third highest “suitability score” of the 33 Greater Belfast libraries covered by this consultation, and has a minimal capital maintenance backlog, but is still recommended for closure. It also has more active users and a much higher suitability score than the recently build Holywood Arches branch that would replace it. I sought clarification from Libraries NI on a number of issues. Some were addressed through the publication of the 33 Libraries Consultation Summary (which originally wasn’t there and the figures were only available for the branches earmarked for closure). They explained that “PAT Use” was the number of up-to-hour-long sessions on Public Access Terminals (internet-connected PCs) in the library branches. And they also documented the algorithm behind the calculation of the crucial suitability score for each library. ease of access to car parking for visitors? ease of access by foot for visitors? ease of access by public transport for visitors? ease of access to library facilities by library customers with accessibility needs (wheelchairs, walking frames, visually impaired, hearing impaired? digital literacy and provision of internet access – for children and adults – in areas with low household internet access? Q5. What assessment has been made of the value that the Greater Belfast libraries recommended for clustering and rationalisation inject into their local community (their natural catchment)? What assessment has been made of the value that will be lost to those communities if each of the recommended library facilities are withdrawn? Q6. Have you figures (for each branch) that estimate the average distance potential customers live from their nearest (or most convenient) library in the Greater Belfast region? And do you have revised figures that show how these figures will change if the recommendations in the report are enacted? If the figures exist, please supply them. Qs4, 5, 6 & 7. The data in which you are interested will be captured as part of the public consultation which is underway (details available on the website); part of our responsibility under Section 75 of the NI Act 1998 is to consult with groups including those representing people with disabilities. So as part of Libraries NI’s initial assessment and report, they haven’t taken into account ease of accessibility, internet access/digital divide, the value that libraries provide to their communities, the potential change to the average distance between library customers homes and their local library, and no account of the (offputting) transport logistics that customers might face if their local library shuts. That’s a lot of information to expect to capture as part of the public consultation, and not to have prepared up front. Who’s going to do it? Libraries NI? Or stakeholder groups? Over the last couple of days, several friends have emailed me about the consultation and the proposed closures. Are Alan in Belfast post topics that predictable?! One commented that the consultation document was anything but user-friendly, not conducive to work through if you have literacy issues. It’s undeniable that community segregation has created a duplication of services in some areas. Another friend pointed out that current customers of Ballyhackamore would be expected to divert to Holywood Arches or Dundonald whenever it closed. Some of these library users are school children who walk to the library and meet up after school. They’re going to be neither allowed nor able to walk Dundonald. And if they’re wearing the uniform of St. Joseph’s Primary School uniform or Our Lady and St Patrick’s, they may not feel safe or comfortable making the trip to either Dundonald or Holywood Arches. The times may be a-changin’ in Northern Ireland, but perceptions (and realities) of safety will only improve slowly. This leads to fairly obvious problems for Libraries NI with their responsibility under Section 75 of the Northern Ireland Act 1998. Unlike the review of Northern Ireland Post Offices a couple of years back where the Royal Mail didn’t make many changes as a result of their consultation, I suspect that Libraries NI have been deliberately heavy handed with their recommendations for closure so that the euphoria of a limited number of reprieves will offset the axe falling on the remainder. Maybe it’s not quite so intentional, but I’ll be surprised if Ballyhackamore doesn’t stay open at the expense of Braniel, Gilnahirk, Tullycarnet, Woodstock and Ballymacarrett libraries. The bottom line is that Libraries NI are in an impossible situation with rising costs, shrinking budgets and they need to make big savings. Or DCAL need to recognise their value to society and increase their budget. Closing libraries may save money, but communities will be poorer. The inevitable result of the proposed cull of Greater Belfast libraries will be fewer people living within convenient reach of libraries, so fewer people using libraries and fewer children being transformed by the potential that reading offers. Maybe those in charge of Libraries NI should start closer to home and ask why they need the Chief Executive to work in a unit in Lisburn’s Sidings Office Park when there’s an enormous new Lisburn library less than half a mile away. Not enough space for a couple of offices? I’ve only talked about East Belfast in this post – the proposed closures and renovations effect the other parts of Belfast too. Many political representatives are lobbying Libraries NI at the moment. They want to hear your views as part of their consultation, either by responding to their questions around or by participating in the public meetings set up around Belfast. If I was in charge of libraries - or perhaps on the Libraries NI board - I'd be keen to see an objective that boosted the number of people coming into contact with library services - whether library buildings, vans, online or other activities. I wouldn't just measure active borrowers. Instead I'd want to include lots of factual contacts too: eg, reading groups, community groups using library premises and space. I'd expect to see smaller libraries becoming part of the hub of communities, perhaps alongside coffee shops, newsagents, post offices, part-time bank facilities. Improving literacy, widening Northern Ireland's world view and perspective, as well as adding and creating value in communities.